Now that January is well underway and Cincinnati has had its first major snowfall of the year, it’s pretty safe to say winter is finally upon us — and it’s here to stay for a while. With the colder temps, new issues can arise when it comes to keeping our home’s plumbing, especially when it’s below freezing outside. That’s when pipes can freeze, and when they do, it has the potential of causing serious damage to your home if the pipe bursts. Not only could your walls and flooring get destroyed by broken, burst pipes, but the leaked water can create mold and mildew that can threaten your family’s health – including the health of your pets. Protect your home this winter from frozen pipes. Below are five signs to watch for to avoid a costly, serious home repair, tips on how to unfreeze pipes, and what to do in the event your pipes burst. Let’s start with the obvious. If you turn on your faucet on a cold day and no water, or very little water, comes out of the faucet or tap, you’ve likely got a frozen pipe. Once you suspect a frozen pipe is the culprit, turn on every faucet slowly to see where the frozen pipe is located. If your home is older, be prepared for multiple frozen pipes once one has frozen. You’ve got to have freezing temps for frozen pipes. Every homeowner, especially those with homes with older, more fragile plumbing, should be on the lookout for frozen pipes once it gets below 32 Farenheit outside. Check any exposed pipes in your home including those in your basement or under your sinks. If there’s frost on them, there’s a good chance that it burst because water has accumulated outside of the pipe itself. You should also check exposed pipes in the garage and in attics. 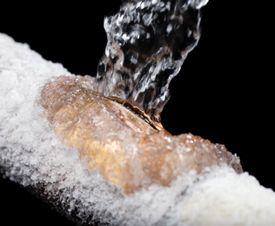 Once you’ve detected a pipe with frost on the outside, shut off its water supply to avoid any additional damage. A frozen, leaking pipe can cause moisture in walls and on the floors. If you suspect a burst pipe in a wall, check for dampness or water stains. Also look for rings on the carpet, buckled laminate, warped wood, and water marks on the ceiling. When pipes get blocked due to freezing, your water supply can back up causing a bad smell from the faucets or drains. First, shut off the water to the section of plumbing that’s frozen. It’s also a good idea to have a bucket and mop handy in case, once the water thaws, it gushes where there’s a break.